Winrock President and CEO Rodney Ferguson addressing the Redlands Forum, sponsored by the mapping technology company Esri and the University of Redlands Town and Gown. Ferguson’s talk, “The Future of Forests: An Optimist’s View,” introduced the audience to Winrock’s forest work around the globe. 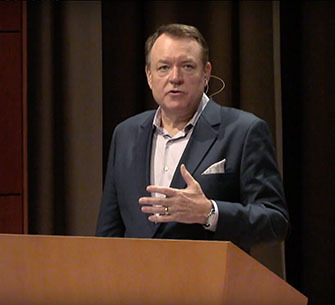 Winrock International President and CEO Rodney Ferguson recently addressed the Redlands Forum in Redlands, California. The forum, sponsored by the mapping technology company Esri and the University of Redlands Town and Gown, features government and business leaders, environmentalists, filmmakers and performers on a variety of topics. Ferguson’s talk, “The Future of Forests: An Optimist’s View,” introduced the audience to Winrock’s forests work around the globe. In this excerpt, Ferguson discusses Winrock’s work in Cambodia. Forests represent 50 percent of the entire land area of the world. Two billion people rely on forests for food and shelter, and forests house more than three-quarters of all flora and fauna on the planet. Forests regulate temperature and precipitation. They contribute to water flows that sustain human and agricultural populations. The contents of the air — what you breathe every day — you can thank a forest for that. But the world is undergoing an unfortunate transformation. We are converting forest land to agricultural and settlement uses faster than at any time in history. We’ve lost over half of the world’s original forests, most of that in the last 30 years. I believe that there’s great hope for us to disrupt this trajectory, though, and to change the future of the planet. And the way we can do that is through the application of technology. Cambodia has the largest amount of what we call ground-level forest cover left in Southeast Asia. It is a beautiful, vastly forested country, but it has the fastest deforestation and degradation rates of any country in the world. 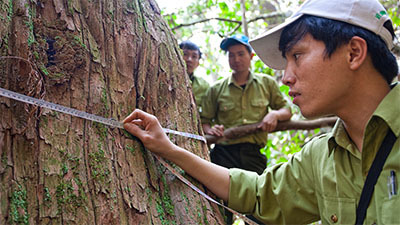 USAID and the Cambodian government asked Winrock to help them figure out what’s going on with their forests. So we worked to develop something called WESTool, the Watershed Ecosystem Services Tool. WESTool is a sophisticated tool that allows us to look at multiple variables that are affected by forest loss. It shows land cover and land cover changes for the entire country every year since 2000. It interprets changes on issues like water availability, sediment and nutrient loss in two rivers, among other variables. As a result, it allows us to deliver a sophisticated analysis of the effects of deforestation. Developing countries have to prioritize; they can’t just stop all deforestation. They need to know where the effects of deforestation and degradation are the worst. 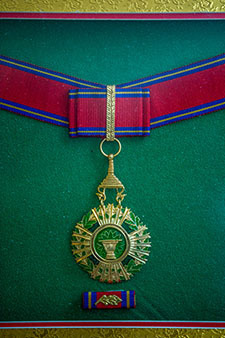 The government of Cambodia awarded Winrock the Royal Order of Sahametrei, the highest civilian honor that can be given to a foreigner in Cambodia, for helping the nation understand its environment. One use of the WESTool is to show watershed changes, sediment loss and predicted changes in water tables over the course of the last 18 years. The Cambodian government now has the ability to look at our data and know where the water loss is particularly severe or to know that whatever it does, it cannot ignore deforestation and degradation in the southwestern part of the country. It has real-time information that allows it to decide where to put scarce resources to save ecosystems. This is a picture of a medal that was given to Winrock by the government of Cambodia. (I was going to wear it, but I couldn’t get it out of the display case!) It’s the Royal Order of Sahametrei, which is the highest civilian honor that can be given to a foreigner in Cambodia. We were given the Royal Order of Sahametrei for our work helping the Cambodian government, the Cambodian people, understand their environment. We’re very proud of that. Winrock can develop the science and technology, we can build the tools, we can merge development activities with technology. We can take this information from the field and the forest to the cloud and back. And in the course of doing that, we can harness and revolutionize the way that we honor the planet. This story originally appeared in the December 2018 issue of RockLinks, a newsletter about Rockefeller Family philanthropy.